Heard These 4 Myths About Dental Implants In Fresno? Learn the Truth! If you’re one of the millions of Americans who have lost any of your teeth, you have more options than ever before to replace them. But when it comes to making the best decision for your oral health, it’s crucial that you have solid information about your choices. Unfortunately, it can be hard to get that in the current age of information overload, and you may have heard some things about dental implants that simply aren’t true. Keep reading to get the facts, once and for all, for 4 common myths about dental implants in Fresno – and get one step closer to restoring your smile! It’s true that getting dental implants requires a small, in-office surgery, but most patients report that it’s no more painful than a simple extraction. It usually takes about two hours, and the first thing a dentist will do is make sure that you’re fully numb and comfortable. Afterward, there will be some mild discomfort for a few days, but your dentist will recommend the right pain medication and give you instructions on caring for the area so you have a fast recovery. Longevity – Bridges don’t last as long as implants because they don’t handle the stress of chewing forces as well. They typically need to be replaced every 10-15 years (implants can last many decades). Healthy teeth are affected – The two adjacent teeth on either side of an empty space are ground down to accommodate a bridge so they can act as anchors of support. 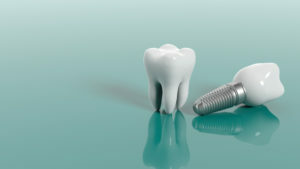 You may have noticed that some offices offer implants at “bargain prices.” In many cases, the reason these implants cost less is because low-quality materials or techniques are being used. Unfortunately, the old saying, “You get what you pay for” applies here. Implants have a very high success rate when they’re done correctly, but if your implant fails because it wasn’t done right from the beginning, it will cost much more in the long run to replace it. Don’t hesitate to ask an implant dentist in Fresno about their training, experience and choice of materials to make sure you’re in good hands from start to finish. In truth, implants look and feel much more natural than bridges and dentures. For a single implant, the crown attached to it will be precisely matched in shape and color so that it blends in seamlessly with your smile. Now that you know the truth about dental implants, you can rest assured that you’re making the right choice for you! Dr. Byron Reintjes is a general and implant dentist in Fresno who knows what a positive impact dental implants have on the lives of his patients. But since each patient has unique needs and goals, he always takes the time to explain every treatment option to help them make the best decision for their oral health. If you have any additional questions, he can be reached via his website or at (559) 438-6684. Comments Off on Heard These 4 Myths About Dental Implants In Fresno? Learn the Truth!